A New York man has been dubbed the “Pied Piper of Raccons” after a video of him drawing almost two dozen furry critters from the woods with a Native American flute tune went viral online. The popular video shows Eddy Lawrence playing his flute on the side of the road in Brasher State Forest, St Lawrence County, as dozens of raccoons emerge from the woods and form an audience around him. The otherwise shy creatures appeared mesmerized by the song, and according to the person who shot the video, around 20 of them had gathered around Lawrence by the time he finished playing. As the song ended, the spell it put on the raccoons seemed to break as well, as they scurried back into the forest. Footage of Lawrence’s performance was posted online at the end of last month, and has since become an internet sensation. He told Inside Edition that the song he played on his flute was a traditional Native American tune called “Raccoon Dance”. Quite fitting name, I must say. Anyway, he recons that the raccoons were attracted by the mellow sound of the flute. 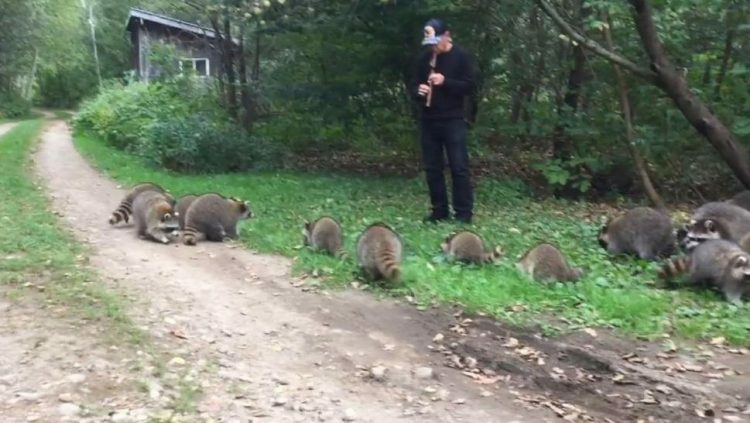 Considering that the man told reporters that he had only learned playing the flute a month ago, people have been speculating about whether his skills are actually what drew the raccoons out of the forest. While some appeared to believe that there was something magical about the tune, skeptics were convinced that the tune itself was nothing more than a dinner bell, and that the animals were there simply to feast on whatever snacks he was offering. To be fair, it does look like some of the raccoons are eating something while the piper is playing, not to mention that these are some of the fattest raccoons I’ve ever seen. It’s still a cool video, but feeding does make a lot more sense than a magical flute tune. That said, we’ve seen animals drawn by music before. Just last month, we posted about Kulning, the ancient herding call used by Nordic farmers to call cattle down from mountain pastures.